This is a confusing book to describe, but I'll give it a shot. 1. Adam Ewing in the Chatam Islands in 1850. Ewing is a notary aboard a ship. His story deals with his illness (treated by his friend Dr. Goose), the island tribes, missionaries, and slaves. 2. Robert Frobisher in Zedelghem, Belgium in the 1930s. Frobisher is a recently disowned (and therefore, quite poor), bisexual musician from England who travels to Belgium to find work with the composer Vyvyan Ayrs. 3. Luisa Rey in Buenas Yerbas, California in 1975. Luisa is a journalist who happens upon a great story about an unsafe nuclear power plant. As she digs into the story, the corporation that owns the power plant chases down everyone trying to let out the story. 4. Timothy Cavendish in London and Hull, England in the present-day. Timothy is a publisher fleeing the brothers of an awful client. His own brother tricks him and he ends up trapped in a retirement home, though he immediately begins plotting a break-out. 5. Sonmi~451 in Korea sometime in the future. Sonmi is a fabricant (clone) working in a fast food chain. She becomes involved with an underground movement to liberate fabricants, allowing them to learn and live like other humans. 6. Zachry in a primitive post-apocoloyptic society in Hawaii in the far future. A more sophisticated group of people, the Prescients, leave a woman of their own kind to stay in Zachry's home so that she can learn about his community. Through her, Zachry learns more about the past and what led to their present society. And the stories are connected like this: Zachry hears the orison (sound recording) of Sonmi~451, who watches a movie about Timothy Cavendish, who receives a novel manuscript about Luisa Rey, who reads the letters and listens to the musical composition of Robert Frobisher, who reads the journal of Adam Ewing. It is clearly a complicated structure, but Mitchell weaves everything together beautifully. The stories are connected through themes as well, including slavery, falling/rising, the number 6, and dominance/property. 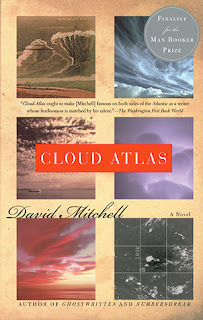 But I'm most impressed by Mitchell's ability to capture so many different voices, personalities, settings, and genres. Each character has a distinct personality and a voice that reflects their time and place in the world. Reading Adam Ewing's section is comparable to reading Herman Melville, the style old-fashioned and formal. Reading Sonmi~451's section, there are unfamiliar words and terms (movies are called disneys, for example), and it is in the style of an oral interview. Reading Zachry's section, the language breaks down into a new dialect. For example, he says: "I stayed a whiles an' visited Pa's icon, an' seein' his face carved in the grain I seen his face lyin' in Waipio River. Oh, hot tears o' shame'n'sorryin' brimmed out" (263). Mitchell is able to convey drastically different, but believable voices throughout the novel. And not only that, but each story is very different in tone. There are Adam Ewing's old-fashioned and formal diary entries, Robert Frobisher's casual and confessional letters, Luisa Rey's suspenseful action story, Timothy Cavendish's comedic break-out, Sonmi~451's solemn dystopian tale, and Zachry's dramatic oral story in broken-down English. I was tremendously impressed with Mitchell's ability to move so seamlessly between these very different genres and voices. However (and I hate to say this) . . . I just wasn't very interested in most of the stories. I kept getting bored, but I read on in the hope that I would get pulled in. Yet even when I did get pulled in, my enthusiasm would only last until the end of the section, when I had to leave the current characters and join the next. With six very different stories, it makes sense that readers would connect with some sections and not others. Personally, I liked Robert Frobisher and Sonmi~451's stories best (likely because I love historical fiction and dystopian stories). Adam Ewing's was my least favorite, but Timothy Cavendish's seemed the most unnecessary. I really appreciated the structure and writing, but it didn't work for me. I'd prefer to pick up Robert Frobisher and Sonmi~451's stories on their own (in separate, more detailed novels). VERDICT: 3/5 stars. Impressive but uneven and sometimes uninteresting. It'll be interesting to see what you think of the movie versus the book. I know most everyone seems to think the book is always better, but I don't think that's always the case. I agree, and I'm definitely hoping the movie is better than the book. It has the potential for some great imagery and from what I saw of the trailer, it looks pretty impressive. I'll definitely do a movie review post when I see it! This has been on my to-read list forever, so I'm glad you enjoyed it for the most part. I'm also really glad to hear that the characters are all so different! Let me know what you think of the movie if you see it. Well . . . A very unenthusiastic enjoyment. I had to push myself through most of it. Mostly just impressed with Mitchell's adaptability. But lucky for you, I seem to be in the minority! :) I hope you like it more than I did. I love it when people are brave enough to write bad reviews! I actually loved this book but I can TOTALLY see how it wouldn't work for some! The alternating viewpoints were especially hard to follow I thought.